Aluminum is the desired metal look for the coastal region. Wrought iron and steel, though sturdy and functional, does not do well in our area due to the rusting principles of the metal. Our aluminum manufacturers have been in business for many years - two of them over 60 years! The products are either extruded or cast, hand-polished, powder coated and finished accordingly. There are endless options for you, as aluminum can be designed with many looks: contemporary, traditional, transitional and many more. The frames are offered in many colors and seating options include cushions, slings, faux wicker, polywood, vinyl strapping and solid aluminum seats and backs. Enjoy!
" 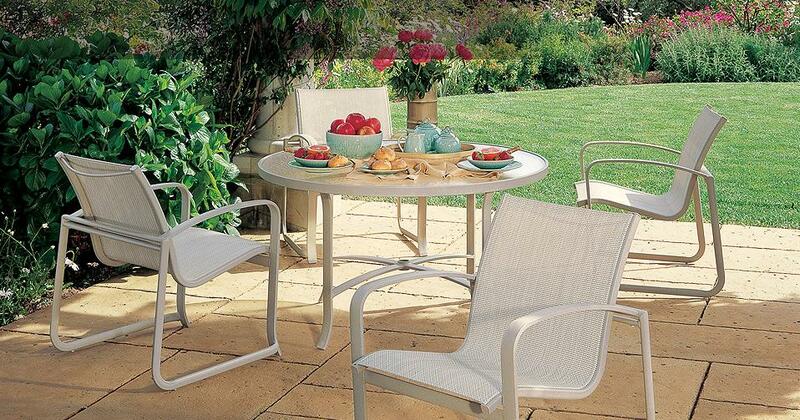 Aluminum, wicker and teak with incomparable designs and quality." "An aluminum master and innovator for over 50 years." "Full range of aluminum designs of a higher caliber."